EcoBuilding Pulse reports that a new law, passed by the French Parliament last week, requires all new buildings in their commercial zones to have a living roof or solar panels. This is less stringent than the original proposal by French environmental activists, which called for complete roof cover by greenery, but is still a huge step toward more sustainable cities and infrastructure. While this will initially cost building owners and developers more money, that investment will be partially offset by the benefits of incorporating either a green roof or solar energy. 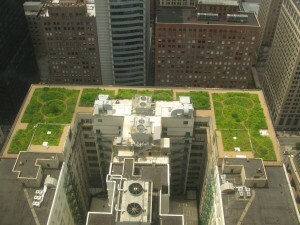 Green roofs act as additional insulation reducing energy costs and act as a rainwater catchment system. Additionally, green roofs can be used for food production or as additional public space, extending per-square-foot use of a building to its exterior. More benefits include improved air and water quality as well as reduce GHG emissions and pollution. The life span of green roofs generally extends two to three times beyond traditional roofing materials. Solar panels eventually pay for themselves in either the form of renewable electricity or solar thermal heat and hot water. This is particularly beneficial in France, which has characteristically trailed behind the rest of the European Union in solar development after a decrease in its use left the country accounting for just 6% of Europe’s installed solar capacity in 2013. France is the first to do something like this nationwide, although other cities have approved similar mandates, including one in Toronto in 2009 that requires green roofs of residential and industrial buildings.